Laxdale holiday park is a small family run park set in peaceful tree lined surroundings. 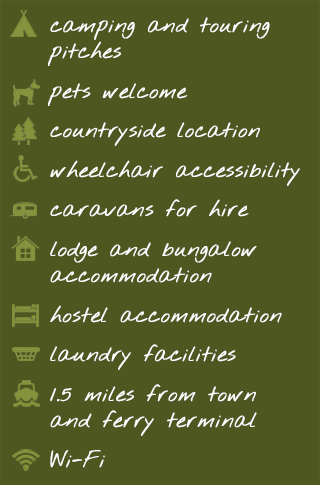 We provide first rate facilities for Campers, Touring caravans, Motor vans and Self Catering holiday makers. Facilities are modern but the park retains the traditional friendly atmosphere that is typical of the Islands. Located 1.5 miles from the town of Stornoway the park is an ideal centre from which to tour the islands of Lewis and Harris. Wireless Internet (WiFi) is available throughout the park. A heated modern amenities block provides dish washing sinks, laundry facilities, toilets, free showers, wash hand basins and facilities for wheelchair users. There are also water standpipes, chemical toilet disposal and waste water disposal points. Copyright © 2019 Laxdale Holiday Park – Isle of Lewis. Theme: Creative Blog by Bishal Napit. Powered by WordPress.